Within the Nang Rong Project, a Geographic Information Sysytem (GIS) was developed that includes a number of base coverages as well as derived coverages for the study area. An invaluable tool for spatial analysis, GIS combines the spatial elements of a map with the powerful information management, querying, and updating capabilities of a database. These data are integrated within a GIS for Nang Rong district, Thailand, that is unique in its temporal coverage of social, demographic, spatial, and biophysical variables. The GIS provides for data input, storage, management, retrieval, analysis, visualization, and statistical and cartographic output. In addition, the GIS allows for the representation and analysis of data at multiple spatial and temporal resolutions. When incorporated into a GIS, data is stored in layers that can be analyzed separately or together, allowing the user to gain a deeper understanding of multifaceted issues. 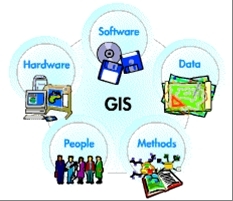 What is more, GIS allows for the synthesis of various data types, facilitating research and analyses that investigate the complex interplay and feedbacks between spatial and socio-economic data. A GIS is more than just the layering of maps, however. The other principal component of GIS is the ability to assign attributes to the features on the map. This capability means that dots on the map are more than just households, areas more than simple soil polygons, and lines more than mere transportation routes. A wealth of information about each household can be associated with every object in the layer. For instance, the household layer could contain information on the number of people in the household, their ages, genders, in addition to a host of other dempgraphic variables. This wealth of information, which would be available in the other layers, would allow for quite sophisticated analysis. This combination of mapping and attribute analysis means that researchers have a powerful tool that facilitates in the understanding of the biophysical and demographic aspects of the project. Within a GIS, various geospatial and demographic data layers, including vector and raster layers, as well as remotely sensed imagery and photos, may be created, modified, and analyzed. A sampling of the GIS techniques, methods, and analyses employed by the Nang Rong Project is listed in the table below. Aerial Photograph Mosaic For 4 of the 5 year sets for which the Nang Rong Project possesses air photos, aerial photograph mosaics have been created. Using tie-points and areas of overlap, photos have been combined into seamless images. For more information, visit the Aerial Photography page in the Remote Sensing section of this website. Agent Based Modeling Agent based modeling (ABM) has been used to simulate the development of villages based on elevation, the distance to nearest water, and distance to the nearest pre-existing village. Representing individual agents within the models, village agents simulate the establishment of villages. A longitudinal survey was used to define village establishment dates for observed villages, an image animation was used to visualize the pattern of observed village establishment on an annual time step, and a GIS to represent topography, and road and water networks as village attractors. Cellular Automata (CA) is a valuable method currently under development in our research to simulate LULC dynamics. CA models are composed of a regular grid of cells, each in a finite state, that are iteratively updated in discrete time steps. Growth or transition rules allow systems to grow from initial conditions, vary their rates of change, or reverse directions in a recursive sequence of iterations. In the Nang Rong setting, transition probabilities may be developed that depend on cell-level resource endowments, such as soils, slope, hydrology, or terrain, demographic characteristics, such as number of households, degree of land competition, or population density, and its geographic proximity to water, villages, roads, or markets. The models allow for the spatial simulation of LULC patterns, examination of likely future LULC scenarios, and the examination of the role of houshold and community-level social and demographic factors in the alteration of trajectories of LULC change, which may result in shifts in the composition and spatial structure of the landscape. Change Detection Following classification into LULC classes, the character and magnitude of change on the landscape was analyzed using post-classification change detection methods. Various types of change were investigated, including intra-annual (seasonal), inter-annual, and decadal change. However, a number of additional image change-detection approaches can be used to characterize landscape dynamics, including change vector analysis, binary masks, Principal Components Analysis, and image algebra. See the Aerial Photograph and Image Classification section of this site for additional information. Cloud Masking Prior to image classification, pre-processing steps were undertaken to remove clouds and cloud shadows from the satellite imagery. Clouds are masked to reduce classification error and confusion, and to increase classification accuracy. Cluster Analysis LULC classification accuracy was improved, while classification error was reduced, through Cluster Analysis, or "Cluster Busting". Following image classification, LULC classes that exhibited high degrees of confusion and misclassification were futher processed in order to extract a finer level of detail about the landscape. Following cluster analyses, the land cover types take on a more speckled appearance, which more accurately mirrors the Nang Rong landscape. Village-to-Village: For each village, the nearest village. This has been performed for various subsets of villages (original villages, villages settled prior to 1950, survey study villages, non-survey villages, etc.). Village-to-Transportation Network: For each village, the distance to the nearest transportation route. The distance to the major east-west (Chok Chai-Det Udom)highway was also calculated. Village-to-Hydrographic Features: For each village, the distance to the nearest perennial water feature. Village-to-Health Facilities: For each village, the distance to the nearest health center and hospital. Through analysis of road network, digitized from the 1984 topographic map, coupled with the aerial photograph mosaics from the 1950s, 1960s and 1990s, efforts are underway to update the network. For the 1990s, road arcs are added that appear on the 1994 mosaic. For the historical updates, the major task is to trace the evolution of roads from the 1950s and 1960s to the 1980s thorough the subtraction of road segments. Land Use/Land Cover Classifications LULC classifications for 37 images were performed using a combination of supervised and unsupervised approaches. Following classification, the quality of the imagery was quantified using accuracy assessment tenchiques, which involved comparing ground collected GPS points and interpretation of aerial photography. Aerial Photograph classification was performed on a limited scale for intensive study sites in Nang Rong. This was a less automated endeavor, and instead relied on manual interpretation of digital air photos. Click here for more information about the classification process. Village-to-Health Facilities: For each village, the network distances to the nearest health center and hospital for the survey years of 1984, 1994, and 2000. Village-to-Village: For each village, the network distances to the nearest village. These have been performed for various subsets of villages (original villages, villages settled prior to 1950, survey study villages, non-survey villages, etc.). Village-to-Hydrographic Features: For each village, the network distances to the nearest perennial water feature. Additionally, the flow distance from each village to a water body was calculated, derived using the digital elevation model (DEM) and slope. In order to characterize and assess the structure and composition of the landscape for various dates, pattern metrics were calculated for the LULC classifications. Metrics include measures that assess the make-up of the landscape, such as number of patches, in addition to measures of the structure, such as connectivity, patchiness, and contagion. Various intensive study sites were examined in order to examine the impact of landscape context on strcuture and composition. Combining GIS, remote sensing and statistical programming methods, the history of each pixel in our study region will be tracked. LULC trajectories, or “pixel histories”, are under development, enabling the examination of space-time patterns of LULC change. The unit of observation is the pixel, and its “life history” is constituted by the values derived from the component images of a satellite time-series. For each pixel, values derived from satellite images captured at multiple points in time are concatenated into a sequence of values in a panel data, or pixel history, approach. Two primary benefits of the pixel history approach are that the current landscape can be understood through the dominant trajectories of landscape change, and that periodic patterns of LULC dynamics can be distinguished. Radiance Diagrams Radiance diagrams, or "Star Diagrams", are another method employed by the Nang Rong Project to understand the village territory, settlement patterns, and land use decisions. Since land use and ownership takes place at the parcel level, the configuration and distribution of parcels is paramount in understanding village territory. For the parcels that were used by housholds within a village, a variety of links were constructed at the village level, including parcel-to-village center, and parcel-to-household. Valuable information about household-level land use decisions was facilitated through this type of analysis. Standard Deviational Ellipses Standard Deviational Ellipses (SDEs) assist in the analysis and understanding of village territory. The orientation, areal extent, and distribution of land in a village can be graphically depicted through the calcualtion of SDEs, which are based on the geographic mean center of the parcels in a village that are used or owned. At the village level, SDEs offer insight and information about the impact of setllement on LULC. Date of Settlement: Villages appear at the discrete point in time that they were established. Administrative Village Splits: As the region grows and evolves, villages that were formerly one village split into two or more administrative villages, reflected through animations. Village Electrification: Following years of isolation in the frontier, Nang Rong became increasingly connected with the rest of Thailand. The development of the electrical grid that accompanied the integration of Nang Rong into the broader political, social, and economic framework of Thailand was animated, showing the sequence of electrified villages. As a means of understanding village level decision making, various watershed areas were calculated for each village in order to ascertain the influence of biophysical resource endowments on LULC. Access to water is critical in parts of Nang Rong, owing to the reliance on rice growing.